Switching the F# & G# is what I had on my very first Sho Bud in 1975. I also set it up with the C# between the B & E.
It was an S-10 with 6&1 and I had no idea what to do with the extra pedals. So I had the very tuning we are speaking of here but with the F# & G# switched. Didn't have any idea it was a E13th because I was so new to steel then. Had the 3 E9 pedals plus some 6th kind of changes that I can't remember now. Think I lowered the E's on the one knee. Was kind of weird and I was not much of a picker then. Still not so hot, but know my limits. Soon after that, I got the Crossover and converted it to a none crossover with 7&4 and started to use a standard E9th but with C# on the 2nd and 9th raised by a knee. Still use that tuning today. I'd say you nailed it Doug. One of my favorite youtube videos. 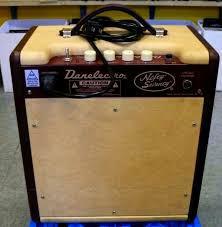 Wanna sell that old amplifier? I also heard it first on Sneeky Petes album years ago and liked it so much then. It's de-tensioned for shipping but it's just a normal set of PSG string so it can be either. Wanna sell that old amplifier? Can't do it, Andy. That one's a keeper! 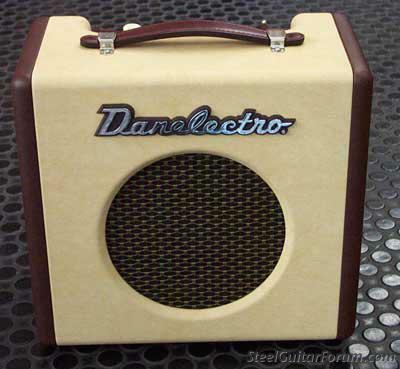 That is a keeper for sure... Keeping my eyes open for a good old tube amp. 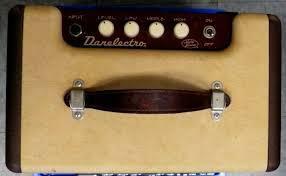 For now I have a great little Danelectro with an 8" speaker I think. Can get quite loud without breaking up. 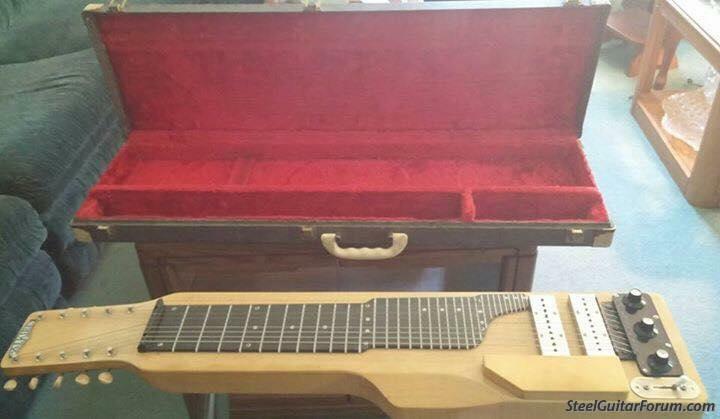 The lap steel sounds wonderful through it and it was only $60 off craigslist. 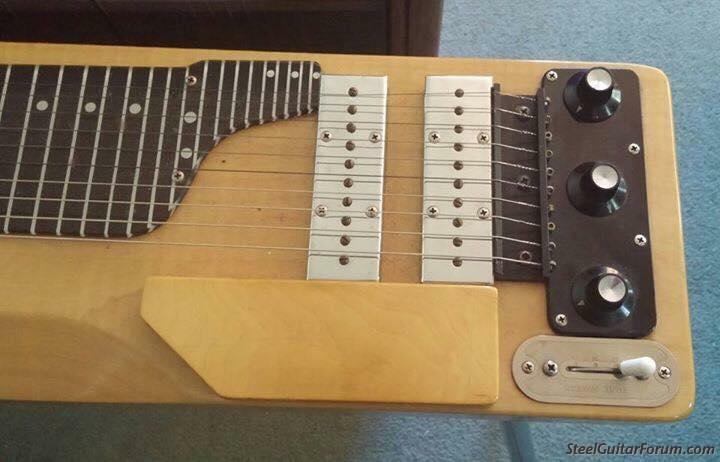 Funny thing is it sounds better for the lap steel than my Peavey Nashville 112. Just curious, what is the Alkire tuning for those? I was not aware they had one. There is a lot to be said for using just one tuning, but I've ordered a triple neck from Todd that should be ready in March when I return to the US for a couple of weeks. I believe someone else already responded to the Alkire tuning question. I'd worked out a few tunes and was starting to get a bit comfortable with it but decided I needed to set it aside for a while. I think it has interesting possibilities, but whether it's where I might most profitably invest the time remains a question. I find C6th odd because of the E stuff at the 4th fret and also I prefer the 5th tone on the top so been playing A6th. Also better because most anything I learn in A6th can be transferred to the E9th steel pedals down. I should put some time and effort into C6th for my Promat D-10. My 8-string C6 has the 5th on top - fairly common, I think (A, C, E, G, A, C, E, G low to high). Thanks for your suggestion. Yes I knew about this alternate C6th used by a lot of steelers. For now I'd still have the issue of finding the positions a little odd, but yes I must do some serious woodshedding on that in the future. Of corse the 10 string C6th has that on the top 8 strings unless a person has stuck a D on top. My Promat has the G there. That woodshedding will help when I get my D-10 back. For now I will stick to the A6 for the reasons I mentioned and also I really like the timbre of the A6th a little better. 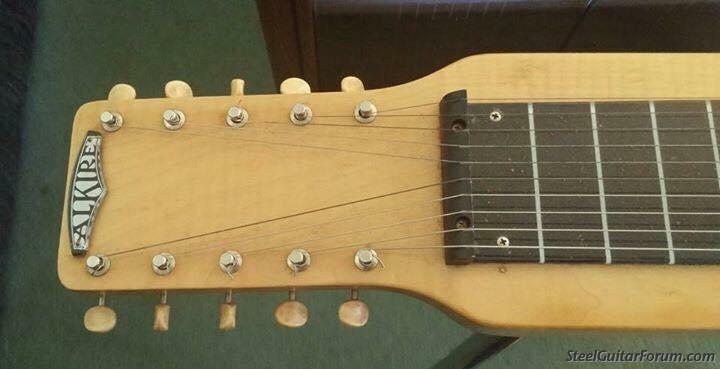 Had even thought of tuning my D-10 back neck down 3 half steps... Not sure if anyone else has ever done that, but I'm sure it's been done by someone sometime. While on this subject have others noticed there is an Alkire E-Harp, 10 string offered at a reasonable price on this page. Looks to be in real nice shape and two pickups also. 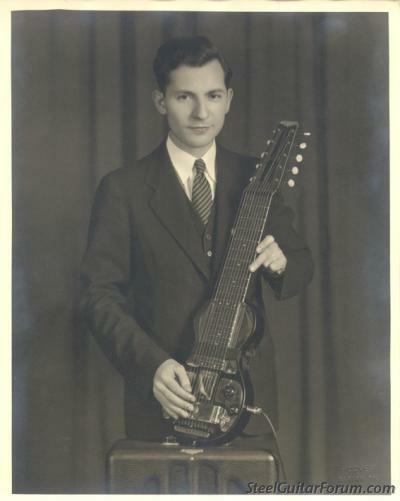 1940, Elbern H. "Eddie" Alkire with 10-string prototype of his "Eharp" electric Hawaiian guitar produced by the Rickenbacker Guitar Company. Bet this baby had the tone!